Your students will get good practice forming words with syllables with my Spanish Blends syllables cut and paste activities for First Grade and Second grade. 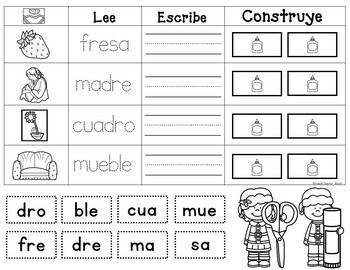 You can use these with your bilingual first grade, dual language first grade, bilingual second grade, and dual language second grade classrooms. Put them in your literacy centers, word work station, use them in small group. You can also use them for independent practice and for early intervention and RTI purposes. You can also have your bilingual partners use them. 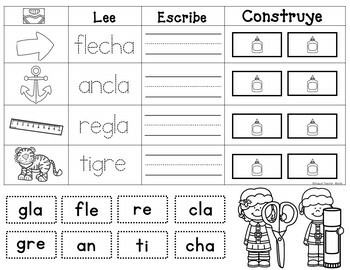 Put them in your bilingual literacy centers. No matter how you use them, your students will love putting syllables together with these engaging, hands on, educational, and fun cut and paste worksheets.